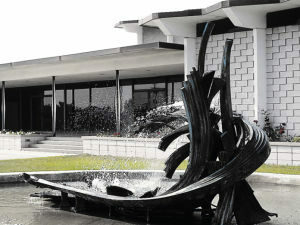 Northeast Michigan’s Center for Art, History, and Science. ART: The Museum has an extensive collection of art that cannot be found any where else in Northeast Michigan, with works of art from Michigan artists such as Tom Moran to world renowned artists like Cezanne, Renoir, Dali, Picasso and Chihuly. HISTORY: Dig for Devonian fossils in the Lafarge Fossil Park and keep all the fossils you find. Stroll through the Museum’s replica of an 1890’s Avenue of Shops. Explore the lumbering and farming history of Northeast Michigan. Visit the Peoples of Lakes and Forest Gallery, which houses a variety of Prehistoric and Native American artifacts unique to this region. Take time to explore the historic buildings on the Museum’s campus. Science: See the Foucault Pendulum which gives visual proof the the Earth is rotating while demonstrating Newton’s Law of Motion. The only Planetarium in Northeast Michigan, the Besser Museum Sky Theater, is open every Saturday at 2 p.m. Visit and Shop the Museum Gift Store. HOURS: Monday – Saturday 10:00 a.m. – 5:00 p.m. ADMISSION: Adults $5.00, Senior & Child $3.00.